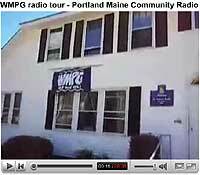 Take a virtual tour of WMPG’s facilities! Have you ever wondered what WMPG’s music library looked like or perhaps the on-air studio? If yes, then here it is, we recently took out our digital camera and took a walking tour. Take a look at our 67,000 cds and 30,000 lps! Check out our new audio console compliments of the Maine Association of Broadcasters. Meet a few of the people that keep WMPG running! Thanks to Stephanie Sample for the creative editing of the video.